Think I’ll buy me a… BFC9000? Amazing photos. We know who’s taking delivery of this monster. 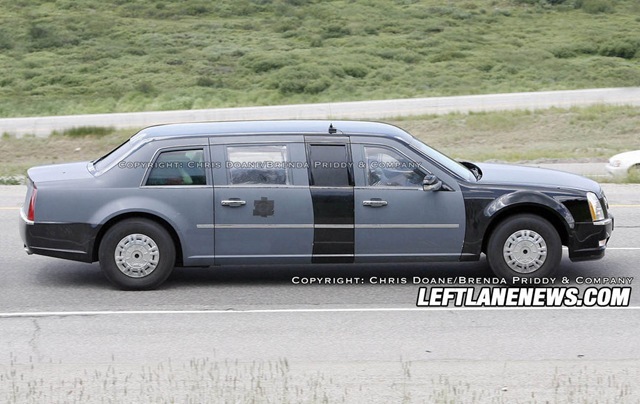 Photographed testing on public roads and highways, we think this behemoth might actually be more of a truck than a limo. With so much armor being added, it appears GM may have needed a medium-duty truck chassis like the Topkick platform. We observed the limo testing along with two regular Topkick trucks and the wheels and tires on the limo appeared to be the same size as the Topkick. The tires on the limo are Goodyear Regional RHS tires, though we couldn’t tell if they are 22.5 inch or 19.5 inch wheels. As far as powertrain, all we can say for sure is that a very large diesel was under the hood. The exhaust note coming from the back of the limo was quite similar to the medium-duty Topkick trucks. Do you suppose he’ll run it on biodiesel? But for the hate radio stereotyping that would follow from the the source of the fuel.